Migration watch; 08.45 - 15.50hrs. The highlight of the day was the second (and Scarborough's fifth) CASPIAN GULL of the year, this time an Adult that was present on Wykeham South Lake for around 20 minutes during the evening before heading off towards the coast, presumably to join one of the roosts out in Cayton, Cornelian or South Bays. Also present on Wykeham were 4 Great Crested Grebe, 4 Egyptian Geese, 23 Tufted Duck and 8 Lesser Black-backed Gull. 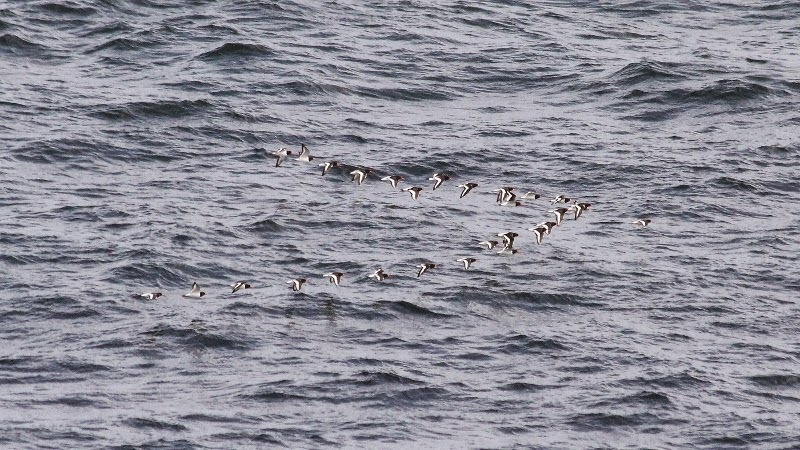 It was another steady day for passage over the sea dominated again by Oystercatchers. On the move (south unless stated) were 14 Fulmar, 7 Manx Shearwater, 2 Cormorant + 7 north, 1 Common Scoter + 13 north, 237 Oystercatcher, 9 Knot, 61 Whimbrel, 3 Redshank, 13 Black-headed Gull, 11 Common Gull, 1 Lesser Black-backed Gull, 13 Great Black-backed Gull, 19 Sandwich Tern + 36 north, 2 Common Tern, 20 Swift, 9 Sand Martin, 58 Swallow, 34 House Martin and 2 Flava. In the Long Nab area there were 220 Linnet and singles of Yellow Wagtail, Chiffchaff and Willow Warbler.